Many years ago I purchased a beautiful 3 metre long wooden table as I love ‘long table lunches’. That is, a table that is reminiscent of the last supper (in length only) where friends and family sit together and enjoy great food over fantastic conversation. Lunch time hospitality has always been a favourite of mine spilling into early evening as the conviviality continues well after the food is consumed. I took custody of the table and for 5-years it sat unprotected in the elements waiting for its new permanent home to once again become the centre-piece of social gatherings. The elements had taken its toll however, and the inserts of the table warped horribly rendering the table un-useable. Not one to give up on my once beautiful table an idea that had been brewing for a while eventually became a call to action and I decided I would mosaic the top and make it more beautiful. I have found my forever home now in a gorgeous Town located 93 kilometres out of Perth in the Wheatbelt region of Western Australia. The table has sat outside on my deck since moving providing me with clear sight of the warped pieces every time I step out into my back yard. It was a chance conversation with a couple of men from the men’s shed at the local farmers market that got me started in what is now the most glorious creative pursuit I have ever embarked on. Ini tially my idea was to simply lay coloured 100 x 100mm tiles using specifically designed mosaic tiles similar to those shown. But then I went searching for a mosaics course for beginners and as if I was destined, I found the perfect workshop. As it turned out the wife in the couple that ran the course and I went to the same high school so we had history and lots to talk about while I learned the basics of chopping, placing, gluing and grouting my piece of art. 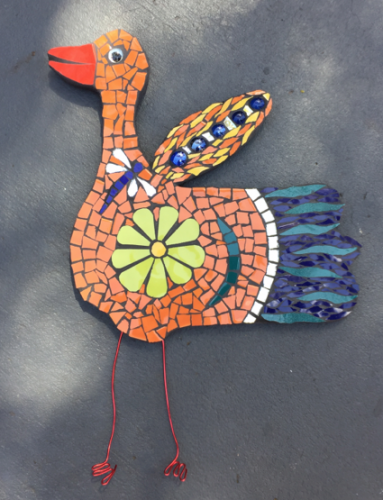 That’s my first mosaic piece, my mexican chook you see on the right. I started poring over ideas in Pinterest for mosaic table tops. The design I came up with for my table was based on a table top I found there – follow me, I have a great mosaics board. Well, I reckon I nailed it! The story of Making my Mosaic Table Top is simply magic! 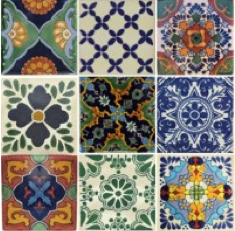 It was so much more than just crafting a pattern of tiles onto a table. It is a fantastic metaphor for life; the bringing together of small, colourful pieces to create a beautiful whole final piece. The therapeutic benefits of being in the creative flow as you think about the design, the colours to use, the need for precision and then placing, replacing and gluing all the pieces into place. It is such a rewarding endeavour on so many levels that I am now running workshops so you too can experience this wonderful activity AND have a practical, beautiful piece of art at the end. Follow my blog and stay in touch, or check out the many workshops that might take your fancy.